Saving gas = fighting evil. Quaint. 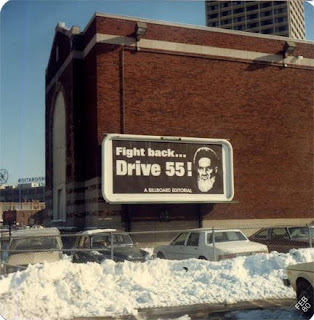 Why, it's Ayatollah Khomeini himself reminding you to conserve gas by driving 55. Yes, that means you too Sammy Hagar. 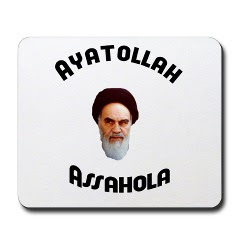 At the time, the Ayatollah was the most-hated man in America, owing to the Iran Hostage Crisis, where 52 staff at the American Embassy in Tehran were held hostage for over a year. Let it not be said that America trails any country in having the latest name-calling technology at its fingertips. 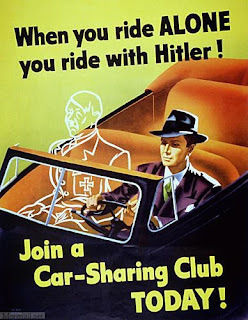 But it seems that the days of these campaigns are over, as Bill Maher points out in his book, When You Ride Alone, You Ride With bin Laden (the title itself a parody of this classic World War II poster)." "Perhaps the most threatening of all the connections we're not making these days is the one between terrorism and one of the great loves of the American life, the automobile. We used to make that connection because the government endorsed it. Oil was regarded as an essential weapon during World War II, and it is certainly no less so today." "We see in posters from (past) eras a government unafraid to call upon its citizens to curb travel, save tin, buy bonds, plant a victory garden - I believe the United States government should (still) be making and plastering everywhere, like they did in World War I, World War II, and the Cold War." Is it time for the government to bring back the propaganda posters and PSAs to make connections for people who can't make them for themselves, as Bill Maher suggests? Or are we so used to buying whatever we want when we want because "we're worth it" that "sacrifice" is a product that can't be sold to us anymore, at any price? We may be the first generation to ask, "Sacrifice? What's in it for me?" It's funny that you'd pick that poster, Kenton. That has to be my favourite WWII propaganda poster. It's downright hilarious if you ask me. I don't think you'll see that kind of propaganda again in the wetern world. Those posters existed in a very different time, with a unifying theme that ran through them. It's unlikely that you would find that same unity anymore as every nation and political party operates their own agenda, and are unwilling to relent to others. Also, you raise a question about sacrifice that mirrors my comments on your previous post about classrooms. These days it's hard enough to get people to give money to worthy causes, let alone get people to give their time and effort to them. And just look at various job sectors out there- the armed forces, police, fire, healthcare sector and more are all desperate for people. Yet they still continue to come up short, year after year. Young people just aren't interested. When you become so focused on yourself it's hard to see the value in serving others.